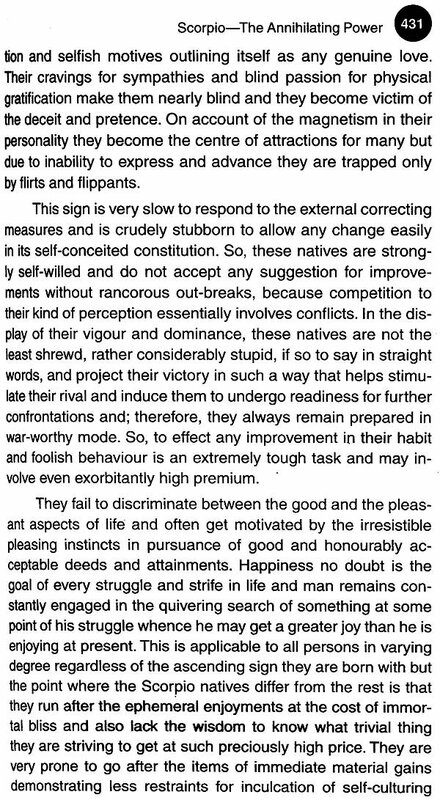 Exhaustive details about the impact of the signs on an individual are not found in the books. 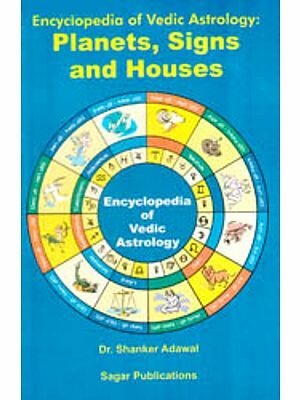 The planets work through the confined premises defined by a house but the tendency or attitude to initiate the said actions is actuated by the energy field of the sign in which the planet is placed in. In fact everything in life is set within the frame work of predetermined scheme. This scheme is prepared by the incarnated soul in its discarnate state under the affectionate and sensible guidance of the guardian angels who also hold the reigns of fate and chance. Pains and sufferings of particular type are chosen by the disembodied spirit for effectively working out the karmic runnels during its terrestrial sojourn. 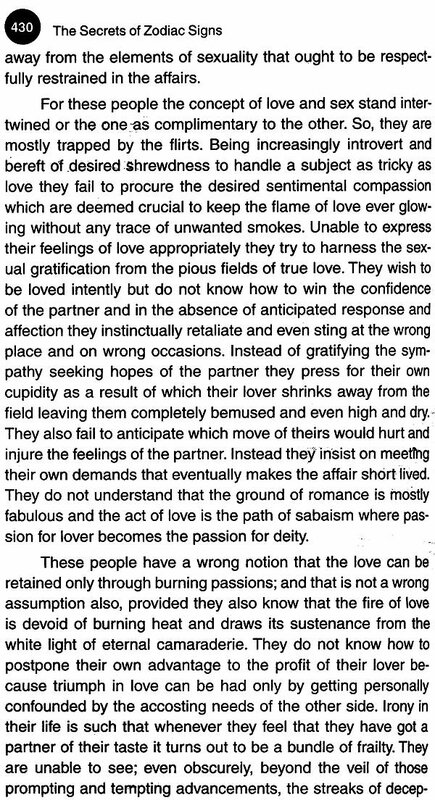 This is based on the grand principle - by what man falls by that he rises OR the same deity who gives the problem also provides the solution OR the grain that gives the sap of tears also brings forth the fruits of pleasure. 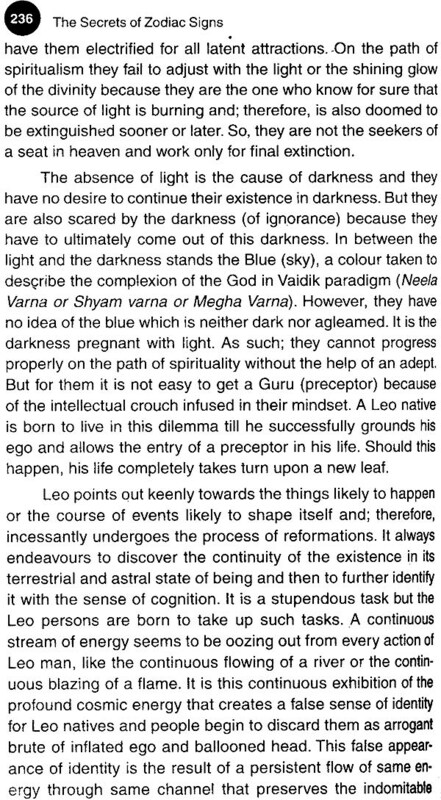 But after taking birth the embodied ego forgets everything squarely. From the nativity same can be gleaned. 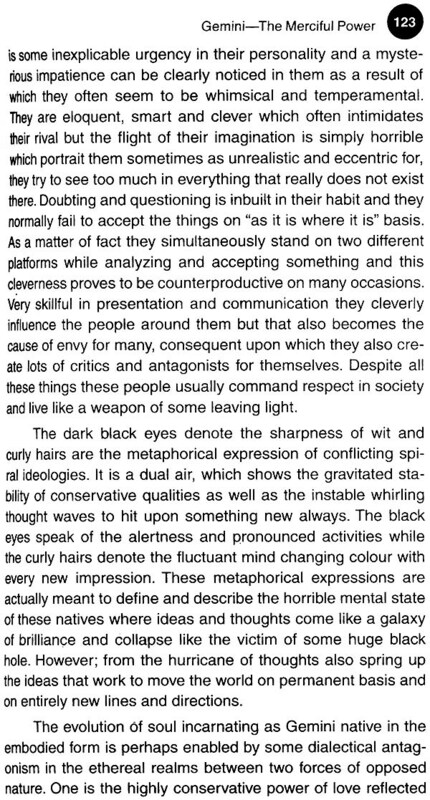 Different signs are the repository of different set of tendencies. In this book an attempt has been made to elaborate the tendencies concealed in the interstices within the force-field of the signs. It is not possible to escape the aquiline darting teeth of the Karma. Impending events tremble in its naked power of assured occurrence. 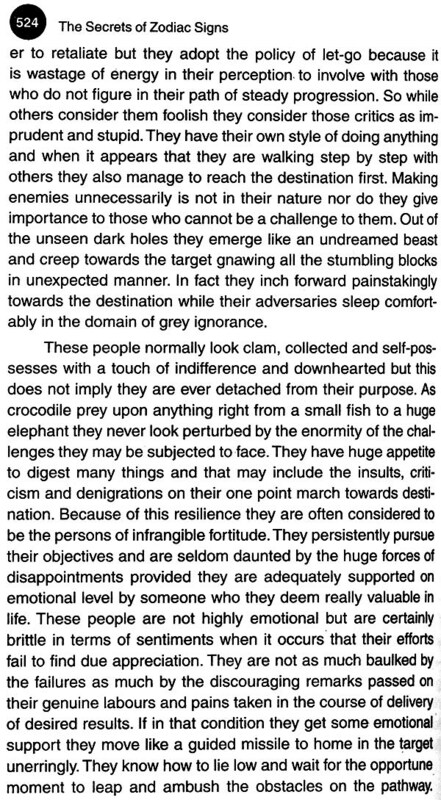 However; by knowing the inbuilt tendencies one can understand the cause of his miseries and may plan to march towards the golden gate of glee.
. centuries. Here in this book he has hooshed the characteristics of zodiac signs to new glorious summit. In the murmurs of some dignified delight one may rejoice the sweetness of some celestial voice. 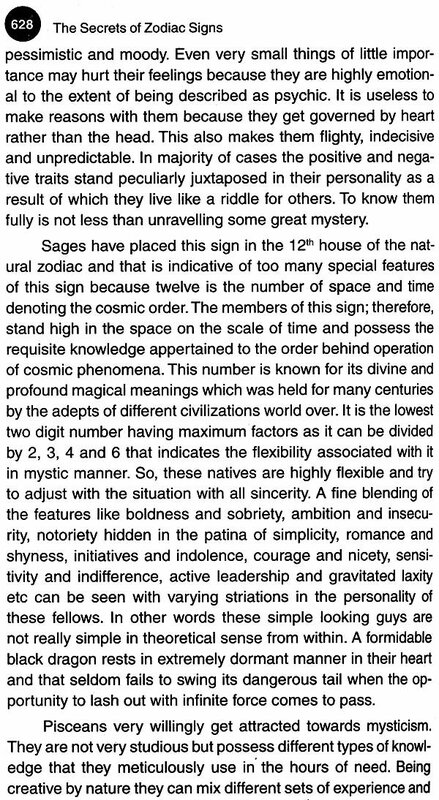 Not much is required to be told in the preface of this work as the signs of zodiacs are familiar to all and many authors in past have tried their hand on the same in their own inimitable styles, that was liked by the erstwhile readers to the optimum extent. As such, I can only hope that my this work will also not be subjected to any cannon of exceptions either for its contents or the style of presentation and same amount of liking would be showered with open heart and throat. A question that always haunts nearly all the sensible students of astrology is ''why the sages opted to divide the zodiac only in twelve segments when many other figures could have been obtained viz 8, 16, 20 etc etc. I have addressed this issue elsewhere in my other book but here I wish to say that these twelve signs are the channels or routes for the discarnate soul through which it comes down for the purpose of embodiment in the current birth in consonance with its own karmic energy signature. 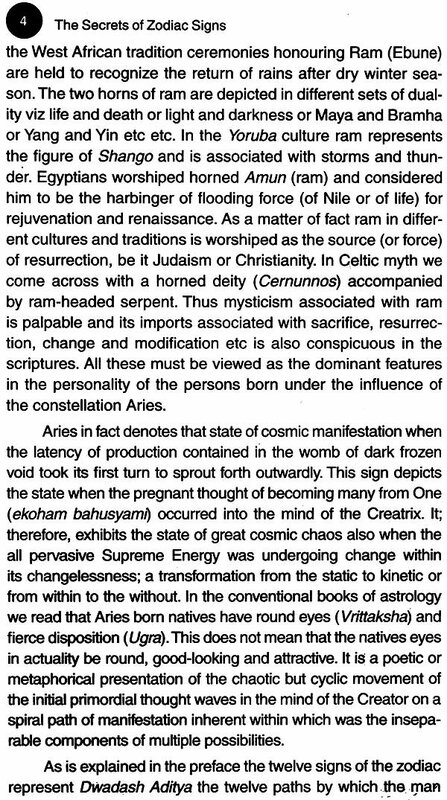 These are the channels for flow of energy, the supreme energy being Aditi, as described by Vaidik sages and; therefore, the followers of this path or channel are Adityas; the sons of Aditi, who are twelve in number. 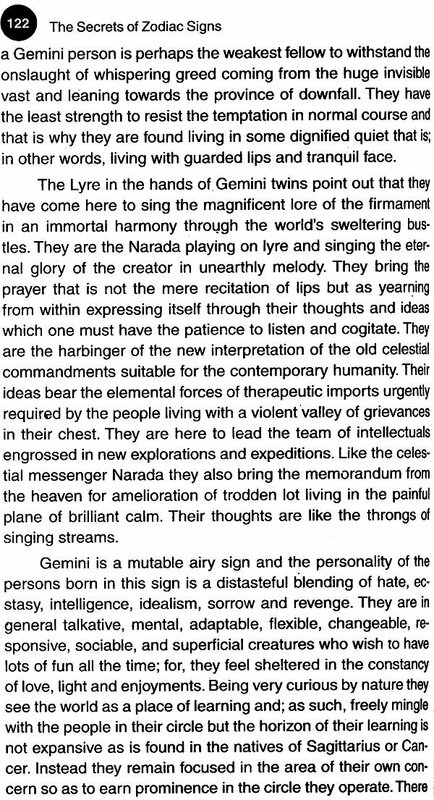 Hence, each zodiac sign seems to be representing an Aditya and the members of that sign would; therefore, have some distinct features to define that path or channel followed for incarnation or in short of that particular Aditya. Man is the most complex creation of his Maker. As such, to understand a man is a tough task. Man is nothing but an extension of his mind. In fact the mind is the man himself. 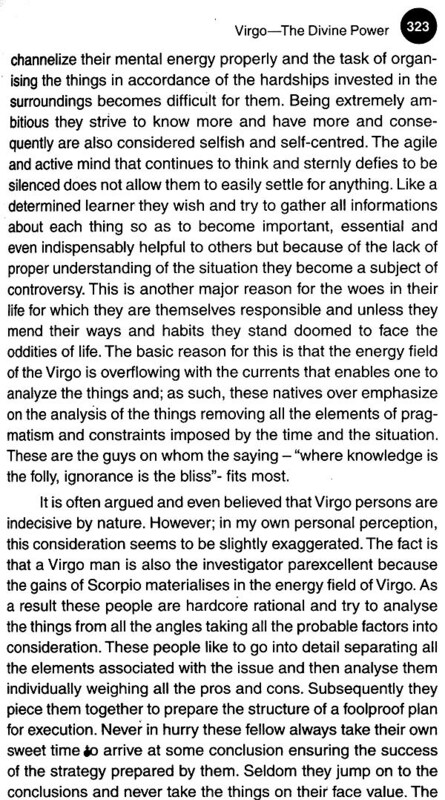 So • The Secrets of Zodiac Signs .while entire body 'exists in mind the entire mind does not exist in the body. This is the great Yogic truth and the distinction of mind and body becomes apparent only in very deep meditation. The gulf of mind and body is bridged beautifully by the breath founded upon which are the basics of all types of meditations. So, the life itself is measured in terms of the number of breaths. That is why it is so difficult to understand a man fully and the judgements made on the basis of external behavioural pattern often fails to yield accurate results. 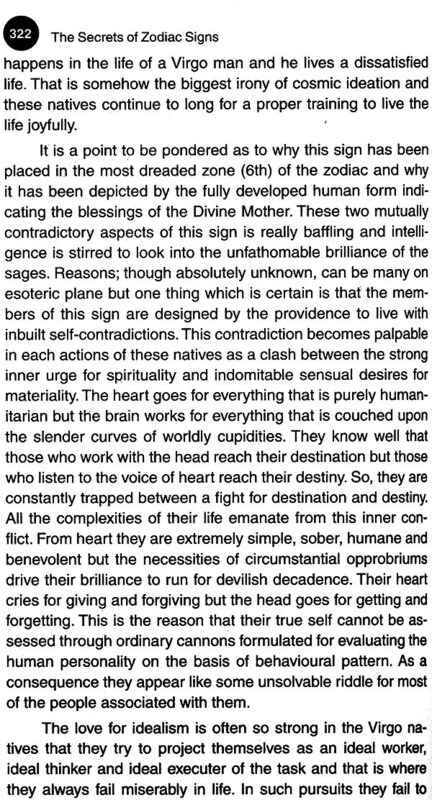 Every birth is a part of some great cosmic mission which is unfortunately forgotten by the incarnated ego under the impact of avid worldly cupidity. Here in this book a faint effort has been made to expose the man to his original nature so as to become aware of the great purpose behind his birth. That is essential for attaining higher human reaches. 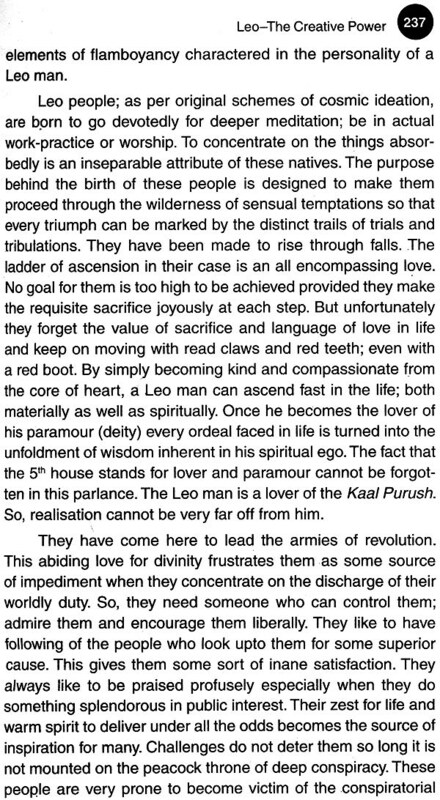 Lagna alone cannot be helpful in solving this complicated knot as each individual is a blending of different types of characteristics that are determined by the energy flowing through different centres of the nativity viz Sun, Moon, Arudha and Karkamsha Lagna etc; just to mention the few. 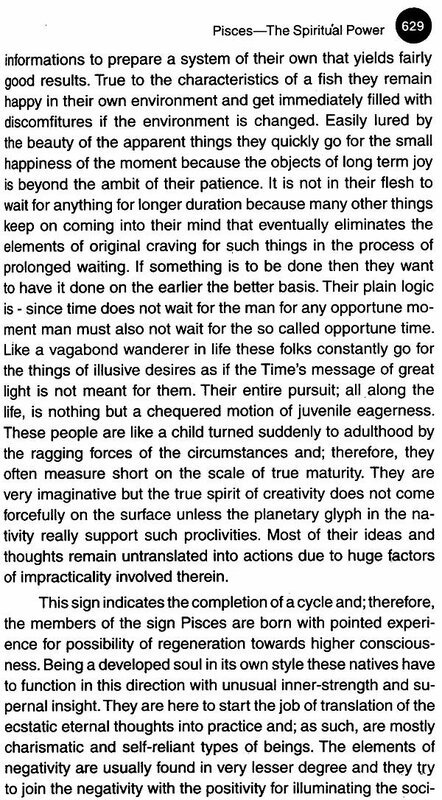 How the karmic energy signature of the native interacts with the cosmic energy under the influence of planets and how these things dangle along the nodal axis in the birth map has been discussed in my other book namely "The Lost Horizon of Vaidik Astrology" and the same need not be repeated here. 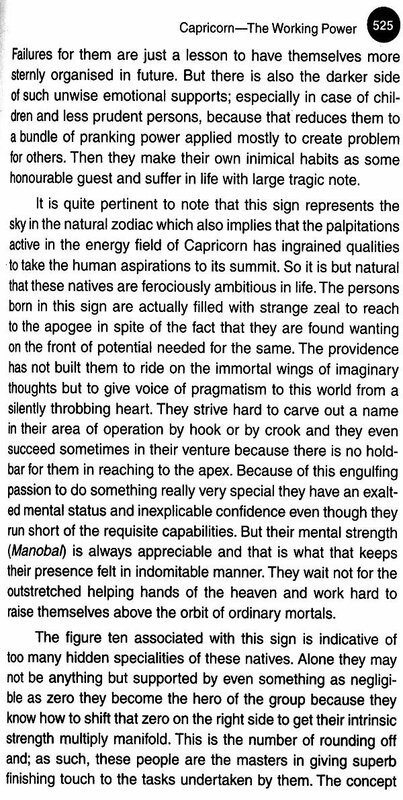 This work on zodiac signs started long back and few portion of the same in condensed form was also published in piecemeal in different magazines. 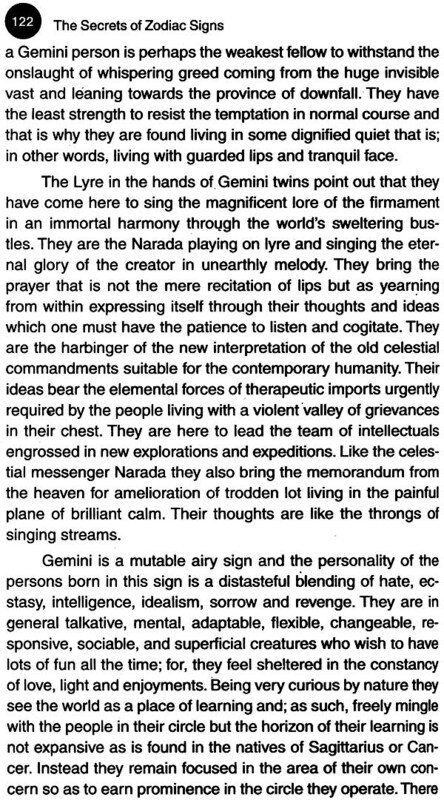 For example a portion of Gemini sign was published in Baba Ji almost two and half decades ago. 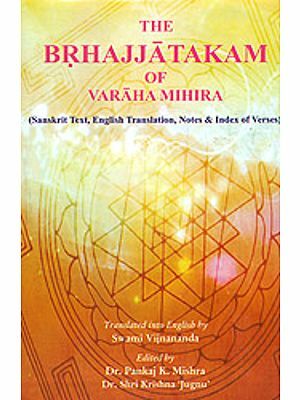 While I was working on "Utopia and Anarchy of Stars" and ''The Lost Horizon in Vaidik Astrology" the work on this book was also going in parallel. 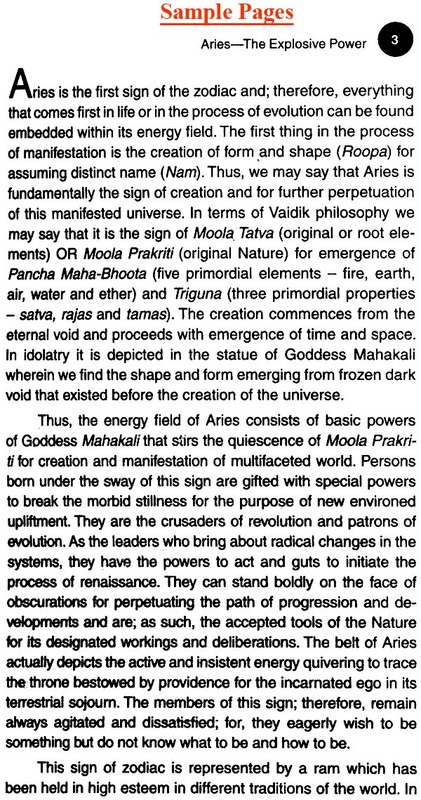 Even the commentary on Phala Deepika was going side by side and that is the reason that readers may find reference from Phala Deepika in almost all the signs. After that; because of inexplicable reasons and over engagements in office and on domestic front, the publication of this book could not be processed. Perhaps providence ad not willed its publication at that time. Recently a friend of mine, Prof Puneet Kausik from Bijnore, saw a few paragraphs of the manuscript and insisted for the publication of this book. While making a reading of the contents I could feel that many modifications are needed for better presentation of the Subject but to do so would have meant that the entire book be written afresh for which I have now neither the energy nor the stamina. As such, the book was sent to the press in its original form which was finally shaped almost one and half decade ago. Readers may kindly forgive me for any shortcomings in the description and enjoy whatever little could be contributed here with my faint fragile pen. Ultimately it is the haunting thoughts nursed in my sleepless breast and quivering pain in mental plenum that has coursed its way on the following pages. Hope my inward urges would find a place to rest in the peaceful joy of the discernible readers who can impartially judge the radiance of the truth detailed herein.